Christmas came early for me this year when Blackie and his pack were found on the airstrip early one morning. The morning rain and mist had just cleared and bright sunshine was starting to pierce through the clouds. Whilst driving down to the airstrip with Ian the tyres squelched through the muddy puddles and the landscape shimmered wet and fresh. As we approached the Beho Beho international lounge we heard that old familiar call of a wild dog. A strange high-pitched whistling sound and one dog ran on ahead off the road calling out to the rest of his pack. We continued on the road and turned the corner surprised to see lots of wagging puppy dog tails. 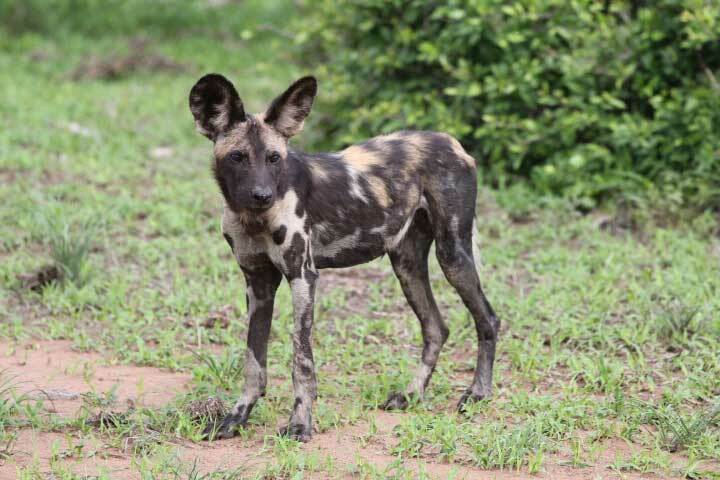 A total of eleven young wild dog pups – a myriad of earthy coloured patches – caramel brown, black and cream. Some chased each other happily playing in the long grass, others pawed in the puddles, some followed keenly after their elders whilst some just stood and stared at the vehicle spell-bound by curiosity. 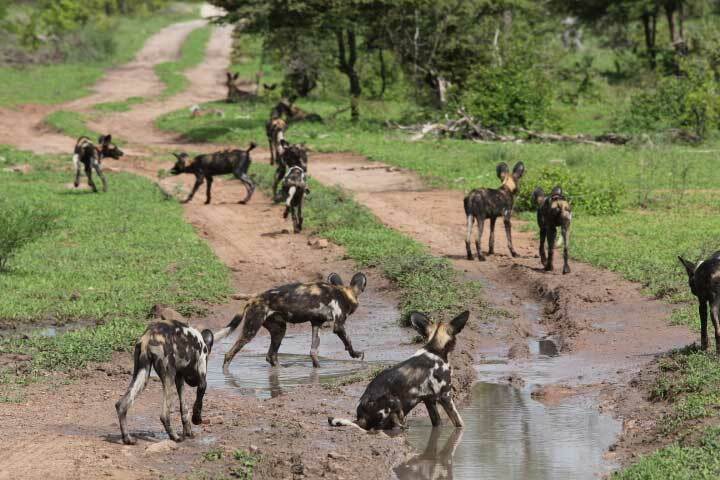 Blackie is the alpha male of the wild dog pack whose territory passes through the Beho Beho area. He is something of a renowned figure – the dog seen regularly and easily recognisable by his pitch black coat and minimal coloured markings. He has been the head honcho of his pack for a number of seasons now and everyone here at Beho Beho is very fond of him. This time he has again not failed to impress us with his bountiful offspring. Eleven healthy and hearty young pups – all in excellent condition and well-fed. Blackie really does live up to his well-deserved position of alpha male. Alpha – the first letter of the Greek alphabet; the first one or the beginning – Blackie definitely is one of a kind. He is now the beginning of an expanding gene pool for the endangered wild dog species. More offspring can carry his genes of strength and endurance on into the future. A few of his offspring will someday take over his position as alpha-male of his pack and some will break away from the pack and hopefully start something on their own. But for now, these pups are doing what puppies do best – play carefree under the protective watch of their older parents and extended family. It is a warm fuzzy feeling that one gets inside when you think about these things. It is the feeling of hope and prosperity for the future. A wish that those things that should blossom – the seeds that have been sown do so and flower into something beautiful, something extraordinary. It is the perfect feeling at Christmas time and at the close of the year 2011. Best wishes to all over the festive period and may 2012 be a radiant year of hopes and dreams in flower.